Some weeks ago we came into contact with a Marineflak veteran which was stationed at Trégastel, south of Brest in Bretagne, France. 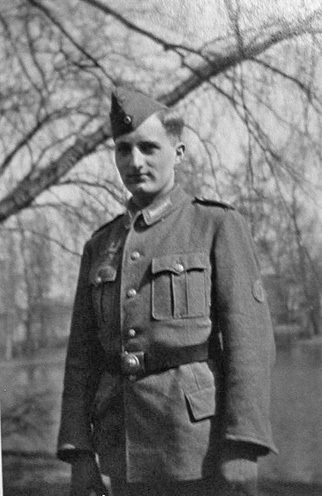 Wolfgang Weber came in from the Flakschule at Misdroy at the Baltic Coast at the age of 19. His story combined with our fieldwork can be found here. I must say, you do know a lot more about MFlak 811 than I ever had the opportunity to gather while I was there. And that is now long ago. Memories fade. [..] Perhaps I can shed a little light here or there. I arrived at 396 in about March of 44 coming from the Flak Training Center near Misdroy at the German Baltic Sea coast. During that short span of time until the Allied invasion and subsequent advances, there really wasn’t much time getting acquainted with the area and location of units. I knew that the heavy guns were of the 10.5 double barrel type. There were 2cm positions in the area but not in our immediate vicinity, to my knowledge. About 5./MFlak (my unit), I don’t know of any other guns of that caliber in the area besides the 3 at BR 396. [..] There were no bunkers at our location. However, close to one of the guns a natural rock formation had created a small low ceiling cave that was utilized as storage place for non-military items of sorts. Each of the guns was positioned on top of three rock plateaus with a low concrete wall around it with storage space for the ammo. The location of the Bt staff of 5./MFlak 811 was at the western limit of Plougastel proper near the water tower. As I was told, French labor was used building a defense trench system around the position. To no surprise, when enemy troops arrived in the area, well targeted artillerie barrages created havoc. The water tower received a direct hit. I have no knowledge of the number of 2 cm guns as well as the location the Bt staff. The Abteilungsstaff was positioned at Plougastel. I was transferred there from 396 to help establish a unit to use forward observer reports about enemy troop advances converting those into coordinates and transmitting them to the batteries for ground defensive fire. After the enemy artillery succesfully destroyed that unit, we were relocated to an empty cinder block building south of Plougastel in an open field area to continue our work. Soon after, a targeted bombing raid leveled this building putting us out of business. With the enemy now advancing south towards the tip of the peninsula, the batteries were ordered to fire at will, we were attached to a small infantry unit which a few short days later had to surrender. I do remember the small Fortress Corbeau. I was there only once for a few hours of work detail. After staying at POW camps in Landerneau, Morlaix, Rennes, and Tourlaville (Cherbourg) I was sent to the US and was at POW Camp Howze in Gainesville, near Dallas, TX until Feb 1946 when the POW’s were transferred to England, where I stayed at a POW Camp near Cockermouth in the Lake District until discharge to Germany in August of 1947. I really don’t know if my notes are of any value or use to you. However, I had fun doing it.